This entry was posted on Friday, January 20th, 2012 at 9:10 am and is filed under Labyrinth OST: 1986. You can follow any responses to this entry through the RSS 2.0 feed. Both comments and pings are currently closed. The raucous joy of “Magic Dance” shouldn’t have come as a surprise from and artist who also narrated “Peter and the Wolf.” Beneath whichever veneer he chooses to use at whatever time frame he exists in, the child-heart of Bowie is always visible. Even in a “downer” song like (my personal favorite) “Ashes to Ashes,” the ending nursery rhyme shows the heart of a child, burdened by knowing too much, experiencing it too soon, feeling it too deeply. He is the essential Man-Child, and “Magic Dance” is one of the finest examples of that. 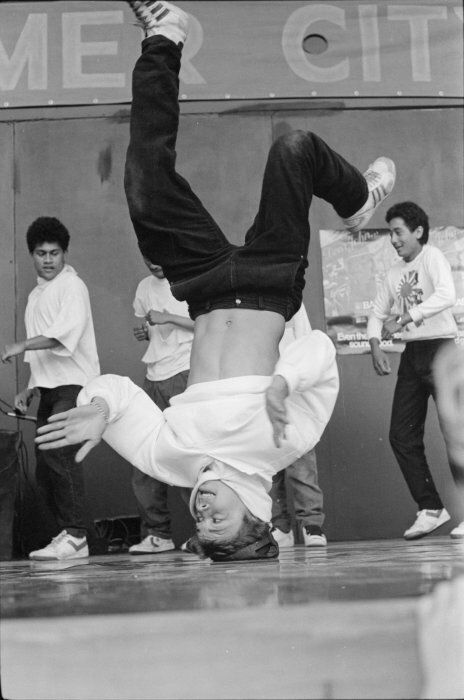 I LOVE MAGIC DANCE! it’s one of the catchiest songs ever. It would’ve been one of my guilty pleasures of Bowie’s work (just wait til you come to Glass Spider – I love that one too), but I’m not really guilty About It. Actually I prefer the album version to the film version. I don’t think it drags and the vocal performances are much better timed in that one. Especially the non-Bowie vocals “slime and snails” “What babe” “Who do”. Also the solos are good and sound fresh on such a typical 80’s song. The movie can essentially be some girls hallucinations about the real David Bowie. Yes it was pretty excruciating at the time, and this didn’t help one’s case at all when trying to defend Bowie against the sneers. Still, I always thought the intro was weird in that idiosyncratic Bowie kind of way, like the sounds of a traffic accident fading in, and your review certainly gives it more substance than I’d ventured to explore, but is it better than “Loving the Alien”? I feel very guilty really as I actually quite like magic dance and quite like the vocal …I don,t know why ? I sat in the cinema loving this one and c,mon its for kids not serious daves having a great laugh at his own expense. The fun has been there since gnome and playfull stuff like please mr gravedigger …..I really like it !!! I think Alan Parker plays uncredited on Rebel Rebel. What was this Dark Fraggle Rock nonsense? Again, guilty as charged! I was 15 when I saw Labyrinth in 1986, and to the present day, I still like to joke that Bowie’s Goblin King made me gay. As if anything can make a person gay… that’s nonsense. But Bowie’s, erm, “presence” in Labyrinth was certainly a key to open a door that I’d successfully kept bolted shut out of panic until then. But let’s not forget that Bowie came with a lot of, erm, “baggage” in the ’80s. He was publicly renouncing the “gay and always have been” statements in his pursuit of chart success in America, but even pre-Internet, such salacious information was forever. ALL the boys (and girls) knew Bowie was “bad news,” and this actually helped me, erm, “embrace” him and explore his older music. In 1983, aged 12, I hated that permed blond twerp who bounced around on MTV every 10 minutes singing “Modern Love” and “Let’s Dance” with such a passion that — no joke — I remember sitting at the top of a carpeted stairwell in my friend’s suburban home, literally lobbing darts down at a picture of Dame Fop we’d stolen from his older sister’s bulletin board to use for target practice. I swear this is the truth; I got the hugest giggle when I finally heard “Station to Station” years later. In 1986, puberty was a-blazing, and Gareth’s silly songs opened up a whole new world for me. And pants (erm) aside, I think it helped that they were silly songs. He was a big (pseudo-ex-)gay goofball, not the sanctimonious pretty boy I’d previously hated. Cheers! I hope I’m adequately testifying that for kids like me whose homosexuality was dawning at the same time as AIDS in the ’80s, even bad Bowie was so much better than no Bowie at all. And it wasn’t just the young men either! I once worked with someone who confided to me that her first “exploration” into womanhood was brought on while ogling Jareth’s tight pants, magic pants. “At the time, this was the end for many old fans.” This old fan, 23 at the time, didn’t make it even that far. Your links are the first I’ve ever seen of Labyrinth. Frankly, thus far everything reminds me of H.R. Pufnstuf. Your analysis regarding “slap that baby” puts “left my baby blue” in a whole new light. I wasn’t born yet when Labyrinth came out; I became a Bowie fan due to a screening of Ziggy Stardust, the film, at age 13 (in terms of David Bowie’s effect on puberty, it’s all Ziggy for me). For me, Labyrinth is neither some awful betrayal nor an adolescent landmark; just a sort of minor, but pleasant and fun, anomaly in the context of his full career. Great music for kids – he wrote well for this movie. As an aside Bowie took Duncan with him to the set for days and weeks and he credits that for the beginning of his interest in making films. I get the feeling He made this for his son and kids everywhere, he made his other merry christmas mr lawrence for adults and art lovers who needed something with depth. Its a good fun film kids love it so the proof is in the pudding. I love it. I love it so much. It’s so dumb and I love it. The failed rock star thing is a fascinating insight, but I think the other dimension of the costume is to exaggerate Bowie’s archetypal “aged seducer role” – the black waistcoat, the tight pants, the disco-medallion. The whole film is centered on the chemistry between Bowie and Connely, the older man luring the young girl into a dark and scary but nonetheless enticing adult world. I doubt it would get released today, honestly. Now I¨m not gonna be able to hear anything else there. XD What does he even sing? Jump, magic jump? Yeah, I’m pretty sure that’s the actual line. A good kids song…a lot of fun, actually. 🙂 A nice melody, inded. 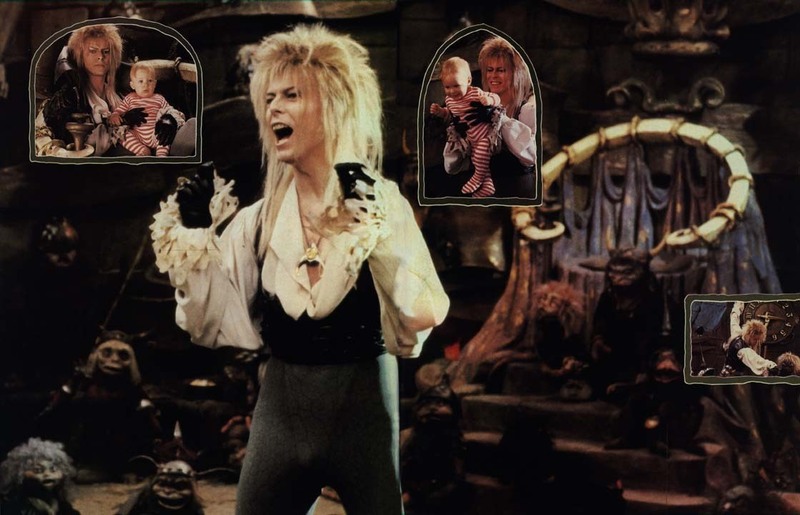 Jareth….I can’t help myself…it’s a good look for Bowie. The best of his post-Baal 80’s IMO (not a fan of the 80’s blond waves). I actually could do without the crotch…thing…distracting and not exactly appropriate for a kids film, but “it” certainly is part of the cult of the film, let’s be realistic. I seems to me Jareth’s look could have been an inspiration for Johnny Depp’s Capt. Jack Sparrow but of course Disney could not have a crotch situation in there. I digress. Good write-up…I’d never connect this to all those things mentioned. It’s almost the same for me. I remembered this song from way back as having the lyric “Dance Baby Dance”. Never heard this before, I must have comprehensively given up on Bowie by the time this came out. It’s not objectively bad like most of Tonight, but with its synths, big drums and gospelly backing vocals it just sounds generic mid-Atlantic eighties mainstream to my ears, not a genre that interested me then or now. By this stage, he is about as far away from the Bowie who did Sense Of Doubt as it was possible to be. It’s really quite bizarre that they could be the same person. But isn’t that the essence of Bowie? Marion – are you the Marion Brent in ‘Tony Day’? This song climbed to #4 on the top ten at Ten on CHOM FM in Montreal !!! alongside some heavy metal and U2 songs. It boggled me at the time. Number 4 on CHOM,you say. Though a Montrealer, I had no idea; I’d given up on both the radio station and Bowie (in that order) years earlier. Strange to think that both played such important roles in my teenage years – and yet I can’t think of either now without feeling a mixture of sadness and betrayal. This is perhaps unfair in Bowie’s case. It is always useful to remember that the word “fan” is derived from the word “fanatic.” A fanatic is often described as “uncritical,” but like any obsessive, a fanatic will take a perceived betrayal much harder than a stable, objective person. Bowie fans are not unique but are intense. Some take the object of their devotion so seriously that, when Bowie doesn’t take HIMSELF seriously, they react as though they have been personally mocked. They simply can’t wrap their heads around silly stuff like gnomes, goblins, and Mick Jagger. It’s a shame that fans have a tendency to not want their idols to ever just have fun without it being Important. And yet, being Important and being ocasionally silly are not mutually exclusive. Richard Feynman did it. Einstein did it. I am told Buddha was also occasionally lighthearted. Personally, I like it when Bowie enjoys himself. And I’m certainly not going to be the guy who only semi-jokingly laments that he stopped using cocaine or that he should not make children’s movies. That would be more than fanatical, it would be selfish. It is quite fascinating to read all the discussion of how this movie is seen as a wrong turn or a stupid move by Bowie, when it’s very definitely the thing that introduced me (and apparently, much of my generation) to him in the first place. I’m aware of Bowie’s…problems…in the mid-80s, and this must have seemed like part and parcel of it at the time, but taken on its own I don’t see how this is anything more than a particularly elaborate Muppet Show hosting gig, in spirit at least. Re-read this on GoRead today. Lovely entry as always. Thanks for the update!